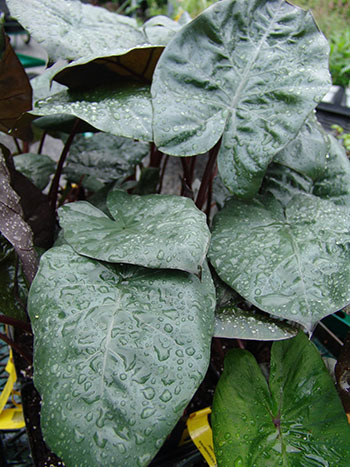 Looking to add a dramatic foliage statement to the garden, consider Alocasia sarawakensis ‘Yucatan Princess’. Alocasia are distinctly bold and exotic looking. Hailing from tropical and subtropical Asia to Eastern Australia, Alocasia are becoming increasingly popular as houseplants. They also make a dramatic addition to the warm season garden as container plants, or if space allows, plant in the ground. Alocasia planted in ground tend to grow larger than those in containers as their roots have greater access to space, moisture, and nutrients. 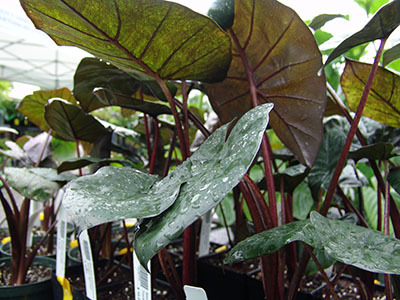 A mutation of the species Alocasia sarawakensis, ‘Yucatan Princess’ produces glossy, patent leather-like leaves held high on strong, sturdy, stems reaching 8’ tall and 5’ wide. While a “princess” in name, she doesn’t mind sharing the spotlight with others and mixes well with other annuals, perennials, and tropical plants. Plant in full to part shade – a bit of afternoon shade is appreciated. Keep the soil moist. Periodic fertilizer applications throughout the growing season will keep ‘Yucatan Princess’ going strong. Plants can be overwintered and prefer a bright, well-lit location. Keep an eye out for spider mites when overwintering inside. Insecticidal soap will keep mites in check. Whether mixing and mingling with other plants or commanding attention on her own in a container, Alocasia sarawakensis ‘Yucatan Princess’ is sure to add seasonal flair to the garden. You can get this great plant for your garden at the Scott Arboretum Selections: Spring Sale on Saturday, May 19.